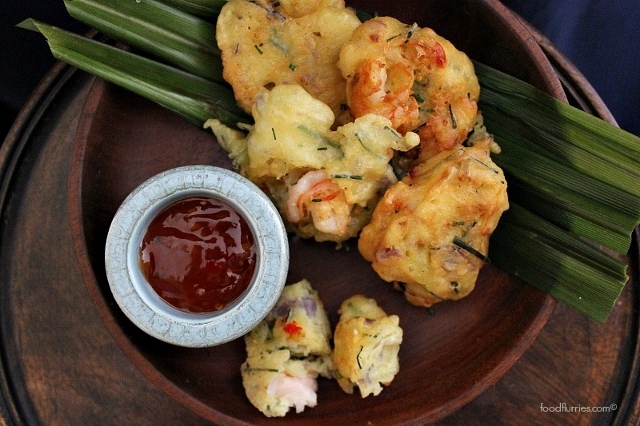 Yummy yummy in my tummy today as I have returned to my roots and decided to make cucur udang for the heck of it. I have been thinking about having something comforting and deep fried lately and this came to mind. 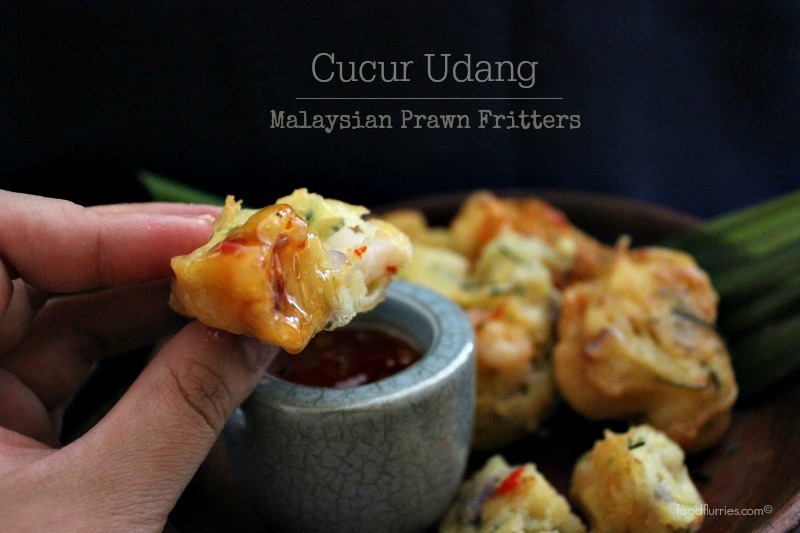 ‘Cucur udang‘ basically means prawn fritters. It is a popular old-school Malaysian snack food. People would traditionally have this during mid-morning tea breaks or in the late afternoon. 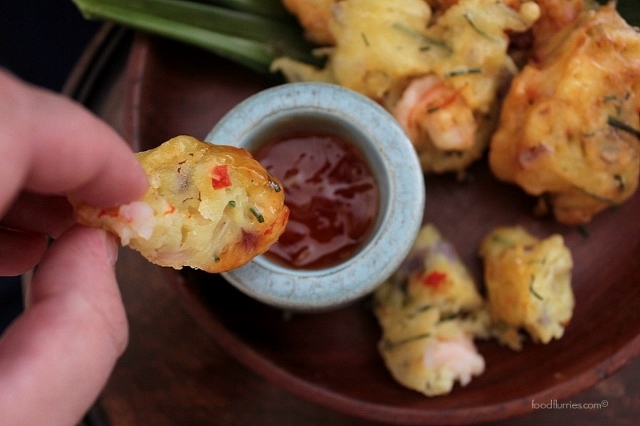 Cucur udang is also well received as finger food at parties. The concept is simple, raw prawn is dipped in seasoned batter along with onions and chives, then dollops of it is dropped into hot oil to fry for a few minutes. The end result is a kind of prawn dough ball which is crispy on the outside and chewy fluffy on the inside. Words cannot express just how amazing this thing tastes, literally a taste from my childhood for sure. Sadly, I feel not many people make this anymore. It used to be found very commonly at street stalls where a mere 50 cents got your three or four pieces. 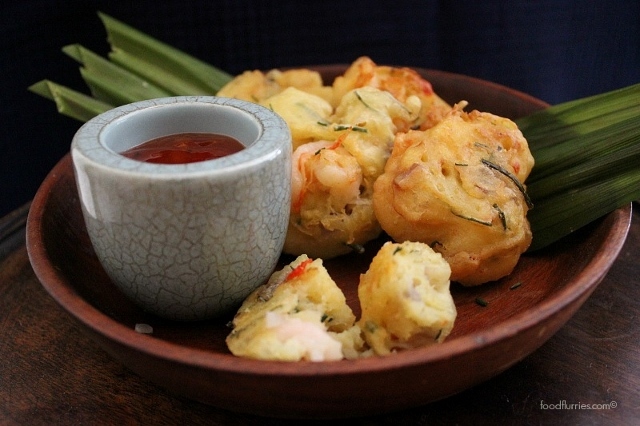 Cucur udang is quintessentially a low cost street food sold by the side of the road and at market bazaars. Dad used to take us down to the local bazaar on weekend afternoons and we would pick a selection of local treats to take home for afternoon tea. Some of my favourites include curry puffs, pulut panggang (grilled sticky rice stuffed with spicy filling), kuih seri muka (steamed sticky rice with pandan custard), fried yams and banana fritters. I really miss those days particularly today so I really went to the effort recreating some of the memories with this recipe. It is simple and straightforward enough … like making pancake batter except with onions and shrimps. Haha. Rinse and peel the prawns. Devein them, sprinkle with a pinch of salt and set aside. Chop onions and chives. Set aside. Mix dry ingredients in a mixing bowl. Add water until you achieve a slightly loose pancake batter. Add the onions, chives and prawns. Heat frying oil in a pot until about 170°C / 325°F then fry up dollops of the batter in small batches, making sure you do not crowd the pot. You don’t want the temperature of the oil to drop too much other wise you will end up with oily, soggy dough balls. These snacks cook easily so they won’t require a long frying time. Once they are golden on one side just flip and fry the other side. Drain on kitchen towels and serve warm with a side of spicy chilli dipping sauce. I like to use sweet chilli sauce because it has a nice balance in regard to the sweet vs spicy ratio. You will want to make a good amount of this stuff because it is soooo delicious and they are definitely a crowd pleaser. To all my Malaysian and Singaporean readers out there … you know what I am talking about. Anyway, enjoy the blog, enjoy this new recipe and continue to join me on my next cooking/travel adventure, wherever that may be. We have not planned for any trips yet for 2019 but that could change in the blink of an eye. Who knows. Stay blessed everyone.